One week after Hurricane Harvey made landfall in Southeast Texas, soldiers and airmen are still working to rescue residents displaced after historic flooding. Texas Gov. Greg Abbott activated 14,000 members of the state’s National Guard this week, and members from other states are assisting as well. The troops will be phased in to help as necessary, once needs are identified and help is requested. About 11,000 Guardsmen have deployed to support the rescue and sustainment operations led by the Federal Emergency Management Agency, according to the Defense Department. There are also almost 2,000 active-duty troops, with another 1,000 prepared to deploy if needed. As of Thursday, according to the Army, the following 23 states were providing Army and Air National Guard members: Alaska, Arizona, California, Colorado, Delaware, Florida, Georgia, Kentucky, Louisiana, Mississippi, Missouri, North Carolina, Nebraska, New Jersey, New Mexico, New York, Oklahoma, Oregon, Pennsylvania, South Carolina, Texas, Utah and Virginia. The troops have joined local emergency agencies to assist with search and rescue, as well as to provide services and supplies to the thousands of people who had to leave their homes after continued rainfall caused catastrophic flooding in the area. According to the National Guard Bureau, more than 5,000 people have been rescued. 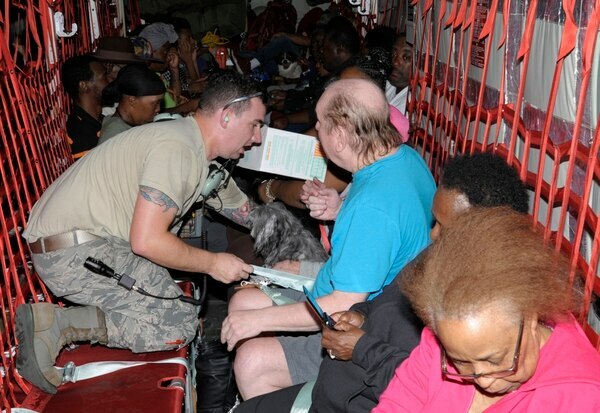 Soldiers from the Army Reserve have deployed more than 26 aviation and vehicle rescue missions, resulting in the rescue and evacuation of more than 3,800 civilians. Maj. Dennis Harding, an aviator and executive officer with the Army Reserve’s 1st Battalion, 158th Assault Helicopter Battalion, flew in a mission to rescue almost 200 people from a nursing home that was without power and starting to flood. 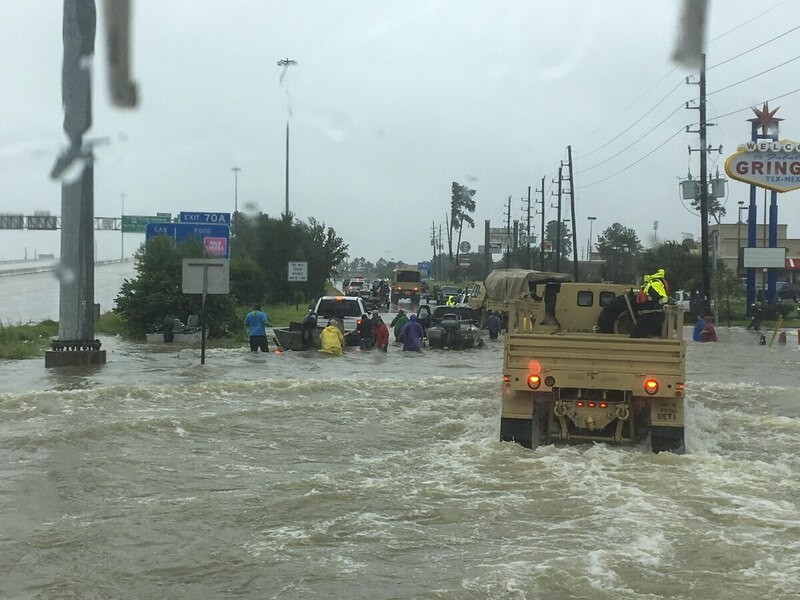 Since the roads were flooded and impassable, the battalion used seven UH-60 Black Hawk helicopters, along with CH-47 Chinooks from sister units, to transport the stranded residents to Conroe, Texas. “I've never been part of a mission of this magnitude before,” Harding, who’s been based in Texas since 2014, said of the hurricane relief efforts. “It was very surreal and very humbling,” he told Army Times on Friday. Harding said that although he flew combat missions in Afghanistan, being able to help those left in the storm’s wake has been one of the most rewarding missions he’s flown. “The biggest challenge is always going to be the unknown,” he said, adding that it’s difficult to know what the conditions are like when there’s no one on the ground relaying information. Soldiers with the Army Reserve’s 242nd Quartermaster Company in Texas transported food and supplies from distribution centers to shelters isolated by the flooding. Staff Sgt. Clayton Maddox, the noncommissioned officer in charge for those missions, said the soldiers helped distribute food, water, clothing, blankets, hygiene products and more to those in need. Capt. Chad Stoermer, the company commander, said their light medium tactical vehicles were able to traverse the 4-foot-high water. “It was nice for our unit to have the opportunity to see our interactions directly affecting the people we serve,” he said. The unit also helped evacuate residents near the chemical plant outside of Houston before it was rocked by explosions on Thursday. Stoermer said soldiers went door-to-door to more than 200 houses to see if anyone wanted to leave in their vehicles after the warning that flooding might cause explosions at the plant. “It was great for our unit to have the opportunity to have an impact and mitigate potential injuries,” he said. About 50 people were evacuated with their unit, he said. The Air Force has more than 1,917 airmen — from active duty, Guard and Reserve —assisting with hurricane relief efforts in the Houston area. They’re conducting search-and-rescue missions, refueling and cargo movement, with eight aeromedical evacuation crews and five Critical Care Air Transport Teams on alert to move medical patients as needed.